Q: Can we fish in the river? A: Yes from May to 30th September. Everyone needs a permit, which we sell in Reception, In 2013, the price was 10€ per day or 30€ for a week. Discounts available for children and ladies. There are carp, perch, bream, trout and cat fish among others in the river. The weekly permit also allows you to fish in other rivers and lakes in this department. Q: What amperage do you have? A: 6amp. This is adequate for most tent and caravan units but you can't use domestic kettles, electric barbecues or other equipment with a powerful heating element. The maximum wattage you can use at one time is 1320w. Q: It says in the guide book that there's some train noise. How intrusive is it? A: About 100m on the other side of the river, there is a train track for local trains and goods trains. They run infrequently but some of the goods trains at night are very long, and as it is otherwise so quiet in the area, you can hear them from a distance. You might also get woken by the bizarre shooshing noise of a hot air balloon as it glides over the campsite and past Chenonceau castle – sometimes quite early in the morning! A: The weather has been so unpredictable over the past couple of years that, quite honestly, your guess is as good as ours! The only thing we would say is not to trust long-range Internet forecasts – they are often completely wrong and perhaps put people off coming to France unnecessarily. Persistent rain is clearly no fun but the Loire is quite a good area to be in when the weather is iffy. It's better to sightsee in warm overcast weather than when it's scorchingly hot – in which case, we recommend enjoying a cold beer in the bar, or an ice cream on the terrace, and relaxing! Q: Can we have barbecues on the campsite? A: Yes as long as you keep them off the ground (we can supply bricks if necessary). Electric barbecues blow our electrics, so we don't allow them. Q: When can we 'check-in'? A: We try to close Reception at lunch-time, even in high season, so arriving after 2pm would be best, The main gate is closed at l0pm and we would encourage you to aim to arrive a good hour before it goes dark, whatever the season. Some people drive through the night and arrive very early in the morning which is fine, but we can't guarantee that your pitch will be available until after midday which is the latest 'check-out' time. A: Dogs are permitted but they must be kept on a lead at all times and their masters are responsible for cleaning up any mess. Q: Can you walk to Chenonceau? A: If you walk along the river from the end of the site, you walk past the château with quite unique views, especially at night when it is illuminated. However, the ticket office is on the other side of the river and takes a good half hour to walk, Not recommended with kids – by the time you've walked there, done the 3 floors of the castle, the gardens, and everything else, the last thing they (and you) will want is a half hour walk back. The car park is enormous so drive there and save your energy for something else! Q: Do you have chalets or mobile-homes to rent? A: No, the campsite is just for people who like campsites the way they used to be! But we can recommend gites/B&B in the vicinity if you have friends/family members who want to come on holiday with you but haven't got their own equipment. Q: Do you have Wi-Fi/ Internet access? Q: Do you have lots of mosquitoes? A: Mosquitoes breed in stagnant water. The river Cher is fairly fast-flowing throughout the year so it's no worse here than anywhere else in France in the summer. Having said that, it's wise to take precautions (i.e. citronella candles and sprays, especially if you're sitting out in the evenings) and bring soothing creams if you do tend to get bitten. Q: What is local public transport like? 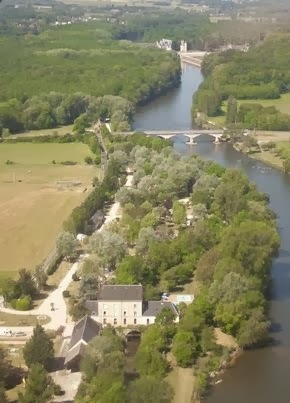 A: We're about 1km from Chenonceaux train station which goes directly to Tours centre where there's a shuttle service to and from Tours Airport (Tours-Stansted flights)' or to St Pierre de Corps which is the TGV station (direct links to Paris 55mins). However, there are very few buses and it's almost impossible to get to the main tourist attractions without a vehicle (or a bike if you're fit and enthusiastic). Car rental is available nearby. Q: Is your site suitable for teenagers? A: Some teenagers have been coming to the site for several years – and they seem to have a good time, hanging out with old friends. Some teenagers are now working for us! So it's not all bad. But we don't really encourage teenagers as we don't have the required facilities – our pool is small, we like peace and quiet at 11pm, we have no discos and nowhere for teens to hang around at night. You can't really walk into the local village bars and there's no wild night life... prospective staff take note!!! Q: Do you hire fridges? A: Sorry no, but you can freeze ice packs or buy bags of ice from the bar (1€ each time). Q: Can we exchange our gas bottles on the site? A: Gas bottles are mostly 'country specific', so you can only exchange an empty English gas bottle in England, an empty Dutch bottle in Holland etc. You should set off to France with a full 'Calor'' bottle or carry a spare. The only exception is Camping Gaz; you can change an empty Camping Gaz bottle for a full one anywhere in the world including on site at Le Moulin Fort. Q: How come you have such conflicting comments on the Review websites? A: We're quite strict with our rules. Dogs should be kept on a lead; cars should keep to the speed limits; children should be supervised etc. We think our rules are fair and reasonable and are there for the benefit of everyone on site. Providing you're happy to respect this (and most campers are), our campsite is a lovely place to be – so many people come back time and time again that we must be doing something right! However, some people like to rebel, don't like being told what to do and our site doesn't suit them. We've accepted that you can't please everyone all of the time and while we continue to invest and improve the site each year, there will always be a minority of people who like to criticise and complain.